Englishmen Exempted from Civil War? Consul, Please Verify I’m Not an American! U S. citizen, single men between the ages of 20 and 45 and married men up to the age of 35 were registered for the draft. This included the immigrants who had quickly become American citizens and living in the northern states. All were subject to the 3 March 1863 Civil War Military Draft Act or Enrollment Act. Over 23%, about 516 thousand of the Union soldiers were immigrants: 170 thousand from Ireland, about 50 thousand from England, Scotland and Wales, but only about 10 thousand Englishmen served in the Civil War. Military researchers and family genealogists are often seeking answers to why their perfectly aged, healthy ancestor did not serve in the Civil War. It can be baffling. But, was your ancestor able to prove his loyalty to his home country as did Robert M. Booth of Jefferson City, Mo? Most Englishmen did not classify themselves as immigrants, but as temporary workers in the U.S. on behalf of British companies. Many Englishmen did not become American Citizens during war time, and they expected to be exempt from the draft. 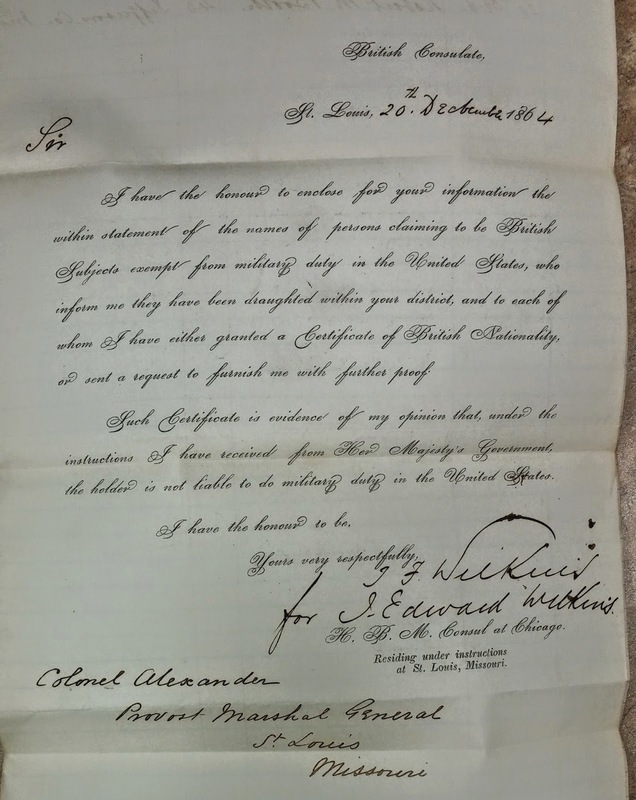 Robert M. Booth was a person claiming to be a British Subject, and the British Consulate of Chicago confirmed his citizenship by writing to the Provost Marshal General of Missouri. In Missouri, the British Consulate had quickly strengthened their St. Louis office to protect their subjects and their property. Booth was “exempt from military duty in the United States” and was issued a Certificate of British Nationality. It was common for men of foreign birth to avoid conscription by not completing the citizenship process or by claiming their alienage. But, across the nation, from Georgia and Kentucky to New York, certificates of nationality were ignored or trashed by enrollment officers, sometimes resulting in arrests. Twenty-six hundred protection papers were issued from the British Consul of Philadelphia before the Enrollment Act. Yet, many draft enrollment officers ignored these certificates since long-term residents (citizens or not) had “enjoyed the benefits of living in the U.S. [and] should not be exempt.” Whereas in Philadelphia most protection certificates were ignored, in Missouri they were often honored. 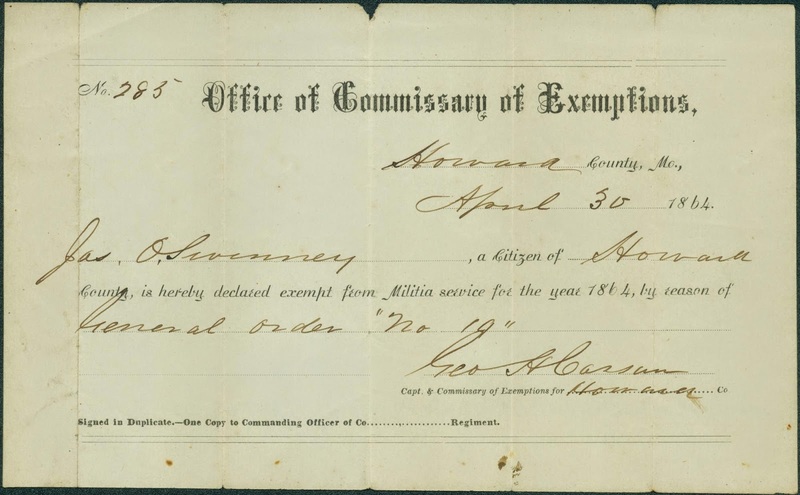 Exempted from Civil War as a Contractor? Right age, good health, no substitute or logical reason! Why was your ancestor exempted from the Civil War? As genealogy researchers we find, in some cases, our ancestors’ disappearance from Civil War records to be baffling. But maybe we haven’t unearthed all the records. Have you reviewed the Office of Commissary of Exemptions records? (E. M. M.). A large number of men were exempted from serving in the E.M. M. and the Enrolled Military (E.M.) due to contractor service. 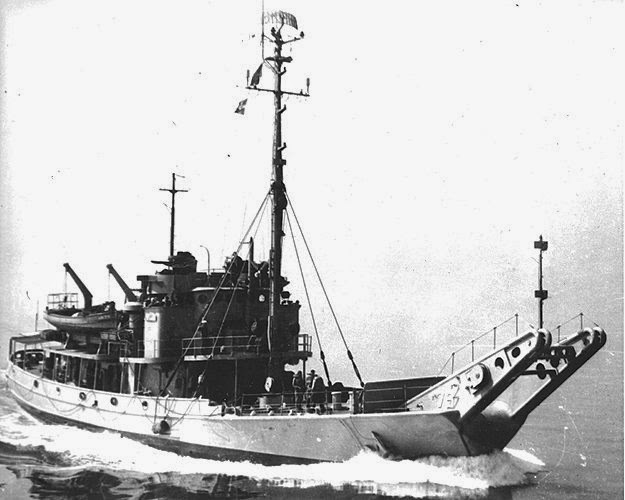 In 1864, the Secretary of the Navy sent a request to the Secretary of War that contractors building the “Monitors ‘Etlah & Shiloh’ be exempted from being mustered into service” until the “sister” gunboats were completed. Union Provost Marshal General, James B. Fry, responded to the Secretary of Navy. 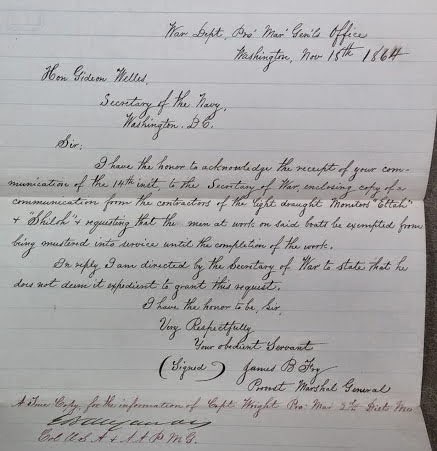 “The Secretary of War did not deem it expedient to grant this request.” Yet, the workers were exempted, from 1864 to the end of the Civil War. Etlah and Shiloh construction workers, like John Carroll of St. Louis, was exempted from Mo. Militia Service by the Office of Commissary of Exemptions. Alex G. Hequembdurg of St Louis was also exempted as were many others. Many records are held in the Missouri Union Provost Marshal Papers: 1861-1866, but researchers must be patient in uncovering their ancestor’s documents, as not all have been indexed/cataloged. The U.S.S. Shiloh and U.S.S. Etlah were “sister ships. Construction of these “iron-clads” began in 1863, but were not completed until the end of the War. Neither saw action. For more information visit the St. Louis’ Ships of Iron, Missouri Civil War Museum at Jefferson Barracks in St. Louis. Know that the Etlah was renamed Hecate in 1869 for a short period, before returning to its original Native American name of Etlah (“white lily”). And Shiloh was renamed Iris in 1869. 5 Places to Research Your Mo. Exempted Ancestor? Missouri Historical Society Archives, St. Louis, Mo. Visit the Guide to Civil War Manuscripts.